The Milenium Dos is part Trasmediterranea’s fleet of high speed catamaran and features state-of-the-art navigation technology plus the most modern and innovative design which translates into making your trip not only comfortable, but also speedy. 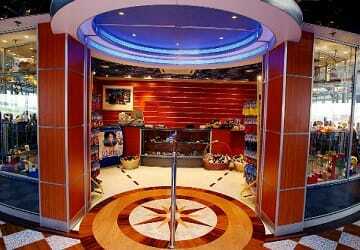 Onboard you’ll find numerous facilities including a bar, baby changing facilities and a duty free shop. 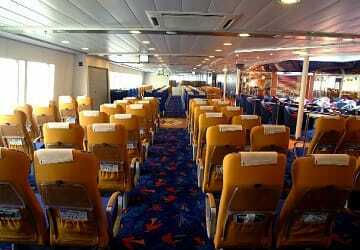 There are no cabins onboard Milenium Dos however reserved seating is available in both standard and club class. 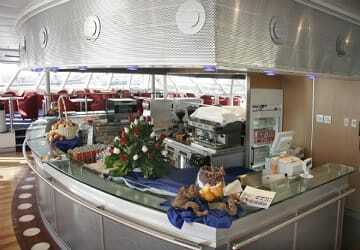 There is a bar with a seating area and a selection of hot and cold food, coffee, juices and soft drinks on sale. You'll also find a snack dispensing machine. In the onboard duty free shop you’ll find a range of different products such as clothing, souvenirs, books and magazines, confectionary and sweets, perfumes, jewellery and more. Please Note: Whilst we have taken great care in making our Milenium Dos guide as accurate as possible, onboard facilities, services and entertainment may vary depending on the date and time of year that you travel, facilities mentioned may change without notification and ferry companies reserve the right to operate vessels other than those mentioned at time of booking without prior notification. Ships are efficient and clean. Makes for an easy passage. "evaluate the quality of direct ferry"
"Algerciras to Ceuta with Trasmediterranea"
Good fast ferry service, Boat clean, staff friendly. Hugely expensive thin stretch of water vis a vis Dover/Calais crossing. We were driving into Morocco via Ceuta. Give yourself time for the border crossing and customs as can seem quite cumbersome and confusing. Will use route again. 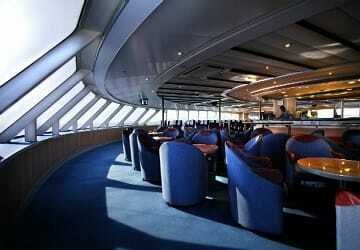 We departed on time, the staff is friendly and it's clean on board. 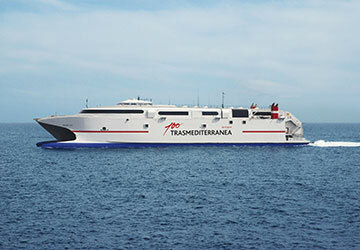 Our recent round trip on Transmediteranea was fast and smooth. 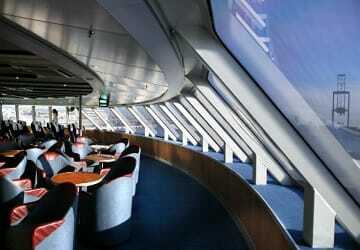 The boarding was efficient, the ship and bathrooms clean and the departures prompt. One of our group had left her hat but they'd saved it in Lost and Found and delivered it to her on our return! Booked this ferry with Direct Ferries with ease via their website. Details of what to do upon arrival was clear. However, be cautious not to get pulled in by the locals who are all trying to sell you tickets. As long as you have your printed email confirmation / booking reference, you can proceed direct to the check in booth 1 hour prior to your crossing. My advice would be don't leave it to last minute - better to have more time ahead of you than pitch up late! We paid the extra money for a Club Seat which was no different of a seat but was a lovely quieter area where a complimentary drink awaits you - lovely. Thank you Direct Ferries for helping our biking trip over to Ceuta a breeze. "My opinion regarding this travel agency"
The trip was very good and that we were going with 2 babies who were not aware of anything, I recommend this shipping company.